The works of the German composer and organist Johann Sebastian Bach are the utmost expression of polyphony (a style of musical composition in which two independent melodies are played side by side in harmony). He is probably the only composer ever to make full use of the possibilities of art available in his time. Johann Sebastian Bach was born on March 21, 1685, in Eisenach, Germany, the youngest child of Johann Ambrosius Bach, a church organist, and Elizabeth Lämmerhirt Bach. There were musicians in the Bach family going back seven generations. The family was also devoutly Lutheran (a religion based on the faith of its believers that God has forgiven their sins). Bach received violin lessons from his father. He also had a beautiful voice and sang in the church choir. In 1694 his mother and father died within two months of each other. At age ten, Johann Sebastian moved to Ohrdruf, Germany, to live with his brother, Johann Christoph, who was the organist at St. Michael's Church. From him Johann Sebastian received his first instruction on keyboard instruments. 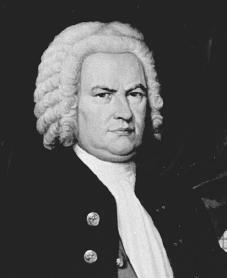 When an opening developed at St. Michael's School in Lüneburg in 1700, Bach was awarded a scholarship for his fine voice. After his voice changed, he was transferred to the orchestra and played violin. Bach often traveled to Hamburg, Germany, to hear other musicians. During this time he also began composing chorale preludes (organ compositions that were played before hymns sung in the Lutheran worship service). Bach graduated from St. Michael's School in 1702.
people complained, he made the preludes extremely short. He also began changing and adding parts to the hymns that confused the churchgoers. In 1707 Bach was appointed organist at a church in Mühlhausen, Germany, a larger and richer city than Arnstad. Later that year Bach married Maria Barbara Bach, his cousin. Bach wanted to present Mühlhausen with what he called "well-ordered church music." His pastor, Johann Frohne, liked both the mass and the music to be simple. The brilliant Cantata No. 71, Gott ist mein König (God Is My King), was written for the service at which new members were placed into the city council in February 1708. It so impressed the council that the music was printed and put into the city records. Still, the conflict between Bach's musical ideas and those of his pastor caused Bach to look elsewhere for a new position. Bach arrived in Weimar, Germany, in 1708 as court organist to Duke Wilhelm Ernst. His new position doubled his salary and allowed him to work in a stricter Lutheran environment. The years 1708 to 1710 saw an enormous output of original organ music by Bach. His reputation at the time, however, came mainly from his organ playing, not his compositions. Crown Prince Frederick of Sweden, who heard Bach play in 1714, was so astonished that he took a diamond ring from his finger and gave it to the organist. In 1716 Bach became upset when he was not offered the opportunity to replace the duke's court conductor, who had died. At the same time Prince Leopold of Cöthen, Germany, heard of Bach and offered him a position. When Bach requested his release to go to Cöthen, Duke Wilhelm refused to accept such short notice. Bach, who had already accepted an advance in salary, became so angry that he was placed under arrest and jailed for almost a month. Bach began his duties at Cöthen after his release. In Cöthen Bach's prime responsibility was to conduct the court orchestra, in which the prince himself participated. In 1720 Bach's wife died, leaving him a widower with seven children. Late in 1721 he married Anna Magdalena Wülken, a twenty-year-old singer. She had to take over the difficult role of wife to a man of genius and also that of mother to his children, the oldest of whom was twelve years old. But she seems to have been equal to both tasks. In addition, during the next twenty years she presented Bach with thirteen more children. Bach produced his greatest instrumental works during the Cöthen period. The other Cöthen musicians were all skilled performers, and their talent inspired Bach to write special music for them. Bach also wrote his major orchestral works during this period. He wrote many of his keyboard works for the instruction of his own children. However, after Prince Leopold married, he had less time for music, and the court orchestra had less to do. This decrease in importance, plus Bach's concern over his children's education, led him to look for another position in a strong Lutheran area. In 1723 he was named cantor (choir leader) of Leipzig, Germany, to replace the deceased Johann Kuhnau. The Leipzig committee was reluctant to hire Bach. His reputation was mainly as an organist, not as a composer, and his ability as an organist was not needed since the cantor was not required to play at the services. His duties were primarily to provide choral music (designed for a choir) for two large churches, St. Thomas and St. Nicholas. In addition, special music was required on certain days of the church year and for other occasions such as funerals. Bach promised to perform not only the musical duties but also other responsibilities in connection with the St. Thomas School, such as teaching classes in music, giving private singing lessons, and even teaching Latin. While in Leipzig Bach composed the bulk of his choral music. Bach gradually lost his eyesight during his final years, and he was totally blind the last year of his life. A few days before his death he read parts of the hymn Vor deinen Thron tret' ich allhier (Before Thy Throne I Stand) for his son-in-law to write down. Following a stroke and a high fever, Bach died on July 28, 1750. Four of his sons carried on the musical tradition of the Bach family. For Bach writing music was an expression of faith. Every composition was "in the name of Jesus" and "to the glory of God alone." His influence on music is well stated in the words of Johannes Brahms (1833–1897): "Study Bach: there you will find everything." Boyd, Malcolm. J. S. Bach. New York: Oxford University Press, 1999. Eidam, Klaus. The True Life of Johann Sebastian Bach. New York: Basic Books, 2001. Wolff, Christoph. Johann Sebastian Bach: The Learned Musician. New York: W. W. Norton, 2000.
he lived with his brother johanr christopn who was the organst at st. michacls church. Johann Sebastian Bach was born on march 21st 1685 in germany.